Having a child with a limb difference is a total non-issue, except when there is an issue. I mean, I often forget that Little Man only has one leg. In the morning he puts on an extra sock, a limb sleeve and a plastic leg. I don’t think about it again until bed time when we take it all off. We would never call him disabled and most of our neighbors, until recently, had no idea that he was any different than the other children who play around campus. … and then a sore appears. The last few weeks we have struggled with what seem to be minor sores on Little Man’s residual limb. Even a tiny sore can keep him from being able to wear his prosthetic and an infection in a sore becomes a concern. This really is the first time we have dealt with any of this, which doesn’t help. We are new at this, trying to figure out the best way to care for our boy with our doctors living on the other side of the globe. We are thankful for the American doctors who live in our city who have helped us keep the infection at bay. We are also very thankful that we had planned a trip to the States to see his medical team. We are not sure what those doctor appointments will lead to. Right now the sore is not getting worse, but not healing which might be the result of many different things – his need for surgery or that his prosthetic hasn’t been fitting well. So our summer plans are shaping up a bit differently than we had planned, but it is a small road bump. We know it will all go back to a non-issue soon. Until then, we would appreciate your pr@yers for extra grace, wisdom to make decisions about his care, and a speedy recovery. For now we are struggling with an active pre-schooler who is suddenly immobile, which creates for some interesting moments and some challenging decisions. 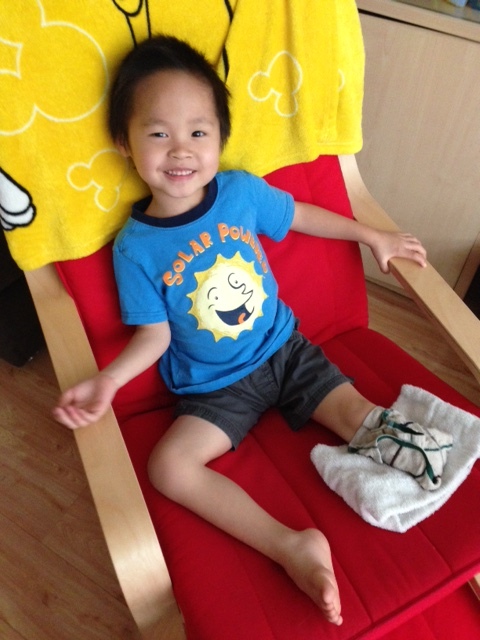 We have begun the quest to find a stroller for a heavy, growing, pre-schooler with on leg. A new stroller is a must on our shopping list for the States because our cheap umbrella stroller just isn’t cutting it any longer. Who knew there were so many types of strollers! And, I am pretty sure they cost more than my first car! Okay, maybe not that much, but it sure feels like it! Wisdom. I truly need stroller wisdom! We are pr@ying the wheel of our stroller stays on for the next three weeks till we get to the States to buy a new one, and in the mean time Little Man is enjoying many piggyback rides. He calls himself “Agent W” because he “flies” around on our backs! 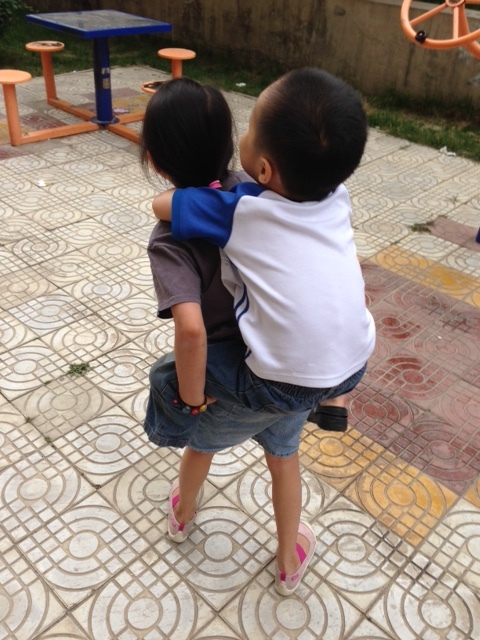 Can you believe that Little Monkey can carry him? We also need wisdom and grace as we interact with our neighbors and friends. Out on our family walk after dinner we had a woman stop us and with utter shock tell us that our son had lost his leg! We laughed so hard! We just couldn’t help it. We have had many folks ask us what happened to his leg, but never had anyone tell us it was missing! 🙂 We know it is gone and we love him the way he is. We would appreciate your thoughts as we strive to communicate that to those around us. We will keep you posted on how his leg is healing, our next steps for his care and the funny stories that come up as we go along! Thanks for keeping us in your thoughts!